Fort Minor is a hip hop ensemble and a side project by Mike Shinoda, one of the lead singers for the band Linkin Park. They feature Shinoda primarily alongside hip hop ensemble Styles of Beyond, as well as a number of other notable guest artists. They are best known for their 2006 single, "Where'd You Go", which features Holly Brook and Jonah Matranga, and their song "Remember the Name". Thus far, Fort Minor has released one album, 2005's The Rising Tied. Fort Minor's Mike Shinoda's plan was to make music while enjoying time with his friends, who include Ryu, Takbir, and many other leading musical artists. Fort Minor's first major album. The Rising Tied, features 16 tracks (with three bonus tracks on a limited special edition version), many of which are specific to the lives of Shinoda and his collaborators. 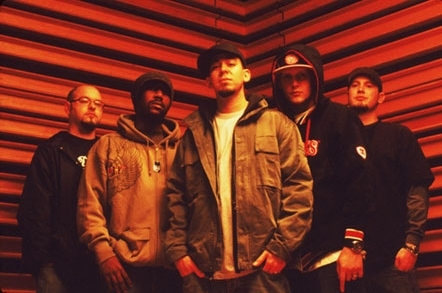 "Remember the Name", for example, describes the group's views on being rappers, while "Kenji" describes the experiences of Shinoda's family during the Japanese American internment of World War II. Other tracks, such as "Slip Out the Back", have more general lyrical themes. In fall 2006, the single "Remember the Name" was used in two promotional TV spots for NBC television's football drama Friday Night Lights. It has also been used in a NUMB3RS episode: "The OG" in series 2. "Remember the Name" is also used by TNT in its Emmy-award-winning Inside The NBA, during various spots during its NBA coverage. In November of 2006, Fort Minor released a new video for "Remember the Name", which features a montage of various amazing feats. Shinoda has stated he felt the video was a nice wrap-up for Fort Minor. Also in November, Shinoda stated that Fort Minor is on hiatus, because of his dedication to Linkin Park. As of August 2006, Fort Minor's debut album has sold 335,000 copies. The mixing samples to "Remember the Name" were released to ccMixter under a Creative Commons license, mainly for the "Remember the Name" remix contest. The samples include the acappellas (both radio edited and unedited) and the music samples straight from recording sessions. The winner of the "Remember The Name" remix contest were Marc Kaschke and Norman Mauer, with their Remember the Name (Kaschke & Mauer Remix) track. The song "Remember the Name" was one of the official theme songs for TNT's coverage of the 2006 NBA Playoffs. Mike Shinoda and Ryu Maginn (of Styles of Beyond) appear in Apathy's music video for "The Winter"
The drum patterns of the song "The Hard Way" were used for one of the theatrical previews of the 2007 movie Freedom Writers. The orchestral background in the song "Believe Me" is the "Apple loop" named "Orchestra Strings 08" found in GarageBand and also in Logic Pro. The cello notes heard on "Remember The Name" were made by a group of cellists playing individual notes in rapid succession, rather than one cellist. Mike Shinoda stated that the string of notes was created on a piano, and he hadn't realized the difficulty in playing the same string of notes on a cello; thus, the cellists devised a way to play it by splitting it up into the individual notes.